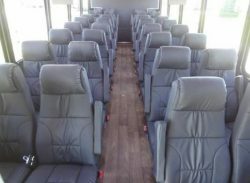 James River Transportation recently added two vehicles to their fleet in order to address continued growth in their Corporate and Wedding business segments. The company has been in business for over 90 years and is a Certified Member of the International Motorcoach Group (IMG). The IMG is an invitation only partnership of the top transportation companies in North America. IMG members are committed to high levels of safety, service and reliability.